Over 2,000 people rallied marched in Leeds on Monday 30 January in solidarity with Muslims here and internationally and in solidarity with the inspiring protests in the US against Trump’s racist #Muslim ban and Theresa May’s disgraceful support for this and her invitation of a state visit – the protest was called jointly by Leeds Stand Up to Racism and Leeds Momentum as part of mass rallies across the country – a new movement against racism internationally is being born! If Trump does come to Britain we will be ready for him! Donald Trump’s #MuslimBan is worrying confirmation that his racist election campaign was more than just rhetoric. The ban is an appalling attack on human rights and the continuation of an attempt to demonise Muslims and refugees. It is unacceptable that Theresa May has not came out and condemned this. Stand Up To Racism nationally has a demonstration at the US Embassy this Saturday 4 February called jointly with the Stop the War Coalition, Muslim Council of Britain (MCB), Muslim Association of Britain (MAB) and Muslim Engagement and Development (MEND) Meet 11am outside the US Embassy London followed by a march to Downing St. Please continue to invite to and share event page: Stop Trump’s Muslim Ban – Stop May Supporting It. There is a Bradford Stand Up to Racism rally on Tuesday 31 Jan, 5.30pm, Centenary Square Bradford. As Donald Trump announces restrictions on Muslims and Theresa May holds his hand we are gathering to say #neveragain #noMuslimban. 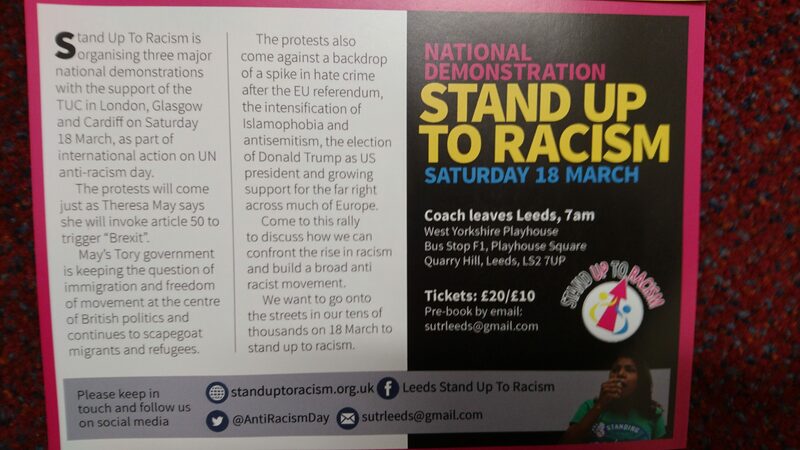 UN Anti-Racism Day demonstration – Saturday 18 March – London – called by Stand Up to Racism and the TUC – coaches going from Leeds – email sutrleeds@gmail.com to reserve your place on the coaches (£20/£10). Happy New Year from the Richmond Hill Depot. As you get rid of clothing and household items items from 2016, please consider donating them to Richmond Hill Depot which sends them to refugees and asylum seekers. We are running low on adult clothing and shoes and would greatly appreciate help from you and your networks. Never Again! More than six million Jewish people and millions of others were killed by the Nazis – Join our vigil to remember the Holocaust and commemorate Holocaust Memorial Day – Friday 27 January at 5pm, Mill Hill Unitarian Chapel (City Square). Across Europe we are seeing a rise in Fascist ideology with Antisemitism and Islamophobia. We need to learn the lessons of the past and to say Never Again! Speakers include: Justice 4 Mohammed Yassar Yaqub campaign, Janet Alder (Campaigner for justice for Christopher Alder), Weyman Bennett (Stand Up to Racism co-convenor), Marvina Newton (Black Lives Matter / Angel of Youths), Councillor David Nagle, Mimi Harmer (NUS Leeds College of Music), Muslim Engagement and Development, Guilaine Brutus (Leeds Refugee Forum). Images from the fantastic Women’s Marches and other rallies and protests against Trump’s racism, sexism and bigotry in Leeds – part of the international wave of historic protests which saw perhaps 5 million people demonstrate internationally on the women-led marches on 21 January 2017 – lets keep the momentum up and turn UN Anti-Racism Day on 18 March into another mass international day of protest against Trump and the racist bigoted ‘mini Trumps’ here in the UK and internationally! 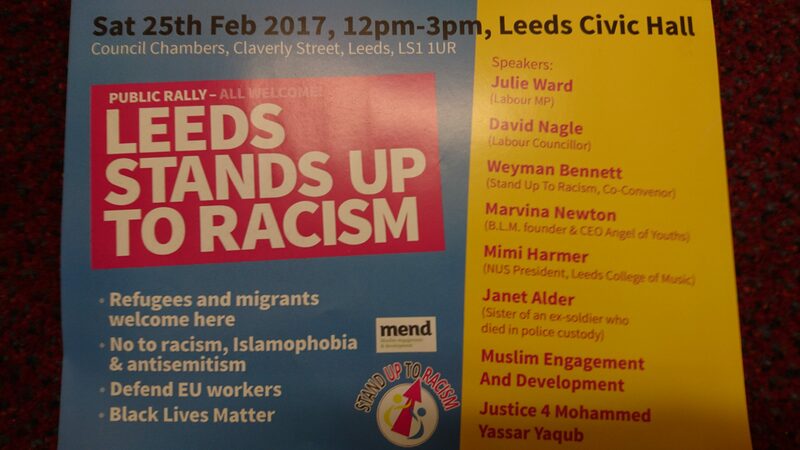 Speakers include: Julie Ward MEP, Justice 4 Mohammed Yassar Yaqub campaign, Janet Alder (Campaigner for justice for Christopher Alder), Weyman Bennett (Stand Up to Racism co-convenor), Marvina Newton (Black Lives Matter / Angel of Youths), Councillor David Nagle, Mimi Harmer (NUS Leeds College of Music), Muslim Engagement and Development. Protest the inauguration in Leeds! On 20 January, Donald Trump will be inaugurated as President of the USA. The most powerful office on Earth will belong to someone who promised to build a giant wall along the Mexican border, the expulsion of 11 million “illegal” immigrants and “extreme vetting” for Muslims entering the country. 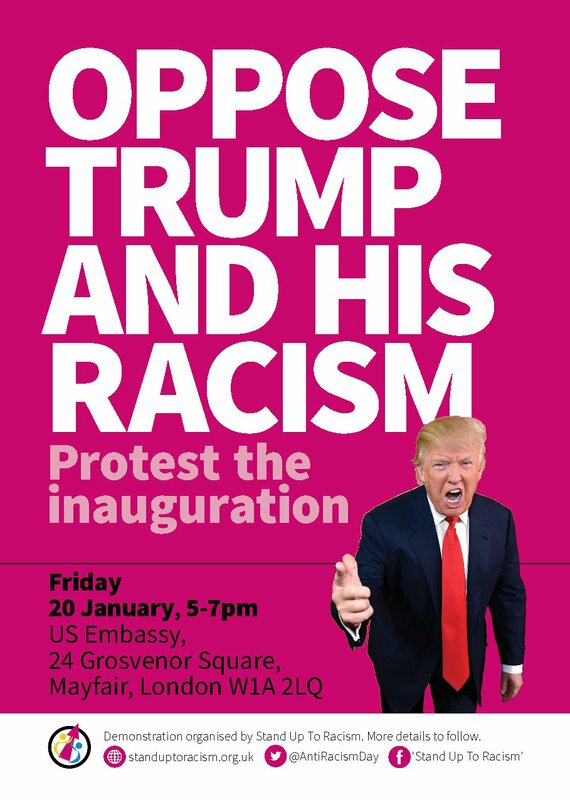 Activists in the US have called protests for the day of his inauguration (20 Jan) – we stand in solidarity with them and will be protesting at the US embassy in London from 5pm and in towns and cities across the country.